number of companies has increased from a few thousands to around a million now. A one man company is an entity in which the entire shareholding is owned by a single person or entity. At present, a minimum two people are required to form a company. The introduction of OPC may change the traditional manner in which the individual or household business functions in the country at present. They will prefer to structure their business in the form of OPC rather than sole proprietorship. Further, it can be extended in respect of creation of wholly owned subsidiaries also. At present a nominal shareholding is allotted to nominees to hold it on behalf of parent company in order to fulfil the requirement of minimum shareholders. It is worth noting that with the recognition of OPC, the corporate veil between the company and the shareholder is further narrowing. One of the challenges will be to regulate the related party transactions and transparency in such companies. The Bill allows creation of Dormant Company for future projects to hold an asset or intellectual property and has no significant accounting transaction. Certain liberal treatment has been extended to dormant company in respect of certain requirements. It has to be seen how the dormant company is going to evolve in future and whether we are going to have investors ready to purchase shelf companies as it is available in certain offshore tax havens. One of the main problems for setting up a business in India is the restriction on merger of an Indian company with offshore companies. The Bill permits such cross border mergers with certain specified jurisdiction. The Bill also liberalises intergroup merger and restructuring. The corporate world has been demanding these changes for a long time as it expedites mergers and restructuring. The maximum number of members in a private company has been increased from 50 to 200. This will definitely cheer up the corporate world as it enables the private companies to increase the number of members without becoming a public company which has to follow more stringent norms. The Bill recognises inter se arrangement between shareholders and transfer restrictions. This will help corporate transactions as uncertainty in this area is one of the major stumbling blocks for transactions. Having said that, changes in the security contract regulations are also essential in order to make these changes more effective. Notably, the Bill incorporates the lessons learnt from the Satyam fiasco and aims to protect the interests of minority shareholders while expanding the responsibility on auditors who will face criminal liability if they fail to report corporate fraud. At least 1/3 of the board of directors of the listed company shall be independent directors. Independent directors can serve 2 consecutive terms of five years each on the Board. Their liability shall be limited. Mandatory internal and secretarial auditing provisions. Limitation of number of companies which can be audited by an auditor. Prohibition on insider trading and forward dealing by directors and key management persons. Uniform financial year from April to March for all companies. Stringent accountability on directors, auditors and other professional associated with the company. Restriction on investment through more than two layers of investment companies. Mandatory disclosure of interest by directors. Streamlined procedure and disclosure in respect of related party transactions. Introduction of voting though electronic participation, meeting through video conferencing. Requirement that at least one director shall be stayed in India for a total period of not less than 182 days. For the investors, the Bill comes as good news for the new law substantially empowers the shareholders. The Bill introduces the concept of the class action suits whereby certain members or depositors can bring suits on behalf of other members or depositors against the company, directors, auditors etc., seeking a wide variety of reliefs, including damages. The concept of class action is well developed in the West. So far India lacked a legal recourse mechanism for collective action by a group of investors against a company. For the first time now, it will allow investors to seek remedial action from courts as a single group. 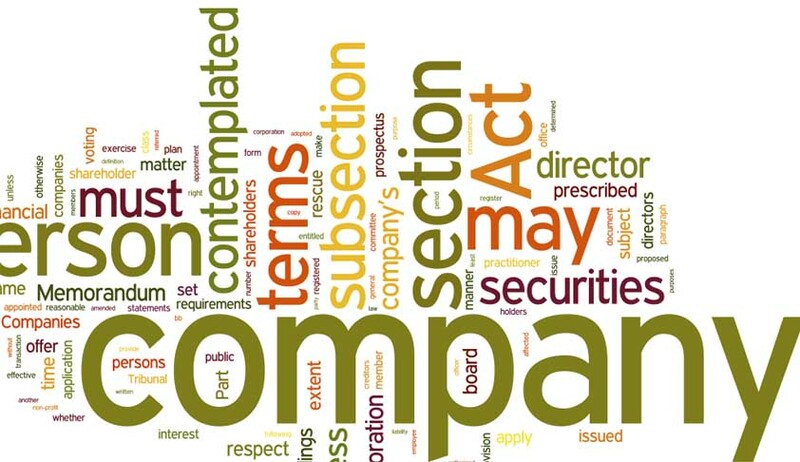 In terms of the bill, a company cannot change its object in the prospects or vary the terms of the contracts referred in the prospectus after raising money form public unless the promoters or controlling shareholder provide an exit opportunity to the dissenting shareholders. This new provision will particularly benefit the retail investors. By giving more power to the shareholders, this provision will enhance the sense of responsibility of the companies. The Bill provides for purchase of minority shareholders by the person/group of persons holding 90% or more equity shares by virtue of amalgamation, acquisition etc. (iii) Serious Fraud Investigation Office for investigation of company related frauds. Another significant provision is the enhancement in the fine amount which the courts can levy while punishing directors, promoters, and other company officials for their wrongdoings. Specifically, failure to adhere to the conditions applicable to private placement can result in a penalty of INR 2 crore INR or more, depending on the gravity of the crime. The Bill stipulates that companies which meet certain set of criteria will have to spend at least 2% of their average profits in the last three years towards Corporate Social Responsibility (CSR) activities. In case, entities are unable to comply with the CSR rules, they would be needed to give explanations. If they fail to do so, they would face action, including penalty. There has been an increased clamor for the need for gender diversity in board rooms all over the globe and India is no exception. The new Companies Bill prescribes that 'certain' categories of companies must have at least one woman director in the Board of Directors. The woman director can be an executive full time working director, a non-executive director or even an independent director, which means meeting independence criteria. Historically, the status of company as a “legal entity” has been exploited in India. Promoters and directors personal wealth and assets have increased despite the companies failing. They were free to use the company funds for their personal gratification in the garb of cross company investments. In the absence of proper auditing standards, even large investors were unable to detect the rot in companies, as was seen in the Satyam Computers scandal. Infact, scams such as Satyam have accelerated the passing of the bill. Undoubtedly, “corporate regulation” is a complex matter. It has to be a right mix of self-regulation and Government regulation. It appears that the new Bill has tried to manage both the aspects. However, the process is still half done. The Bill only lays down the basic framework of the company law and leaves the procedure to be determined by the rules to be formed by the Central Government from time to time. The real challenge will be to formulate an efficient and transparent procedure which will run the Indian corporate juggernaut smoothly and curtail corporate scams. In this connection, all eyes will be on the Serious Fraud Investigation Office (SFIO), the agency mandated to investigate corporate scams, which has been armed with the authority to impose punitive measures and in specific instances, arrest persons found guilty of corporate crimes. Live Law would like to thank P V Shiju, Head of Legal, International Funds, Kotak Mahindra Group for his inputs to this story.